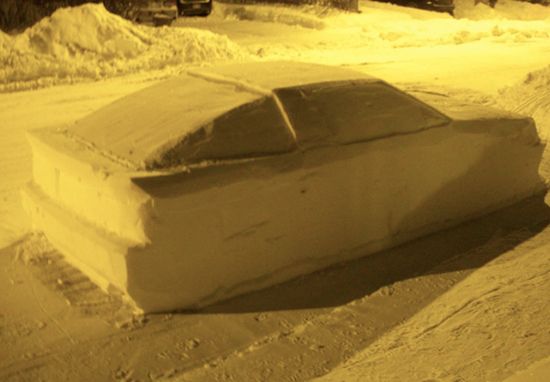 Getting a parking ticket can be frustrating at the best of times, but imagine this happened to a car you had literally made out of snow. 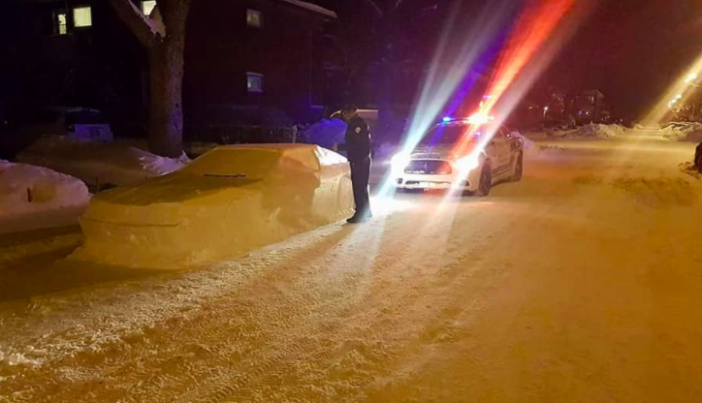 It is a genuine testament to Montreal machinist and cabinet maker Simon Laprise that police officers mistook his icy sculpture for a very real – and badly parked – vehicle. 33-year-old Simon had envisioned the car as a replication of the iconic DeLorean DMC-12 from the Back to the Future movies; and the resemblance is uncanny. And yes, it makes every single one of your snowman building attempts look pathetic, carrot or no carrot. I’m sure you will agree this car was beautifully, painstakingly detailed; with everything from the window to the wheel rims perfectly outlined under Simon’s skilful hands. 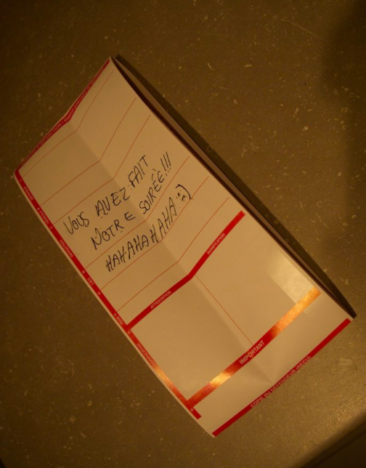 Creative Simon had even bobbed a real windscreen on his masterpiece, which he had luckily discovered in the street. Inspiration struck after Simon spotted a huge pile of snow outside his place of work, sending his imagination whirring. So I decided to do something out of the mountain of snow, to do a little joke to the snow guys, and have fun sculpting a car. It’s not my first one, just the first I do in the street on snow removal day. To me snow is a great free material to sculpt anything out of. Simon had only intended to prank the snow removal team, and had no idea his mischief would fool the boys in blue. In some parts of Canada, parking within a snow removal zone where ploughing is about to take place is strictly prohibited. When Simon left his ‘new car’ parked up for the night in a place where ploughing was scheduled, he could not have imagined the ruckus it would cause. 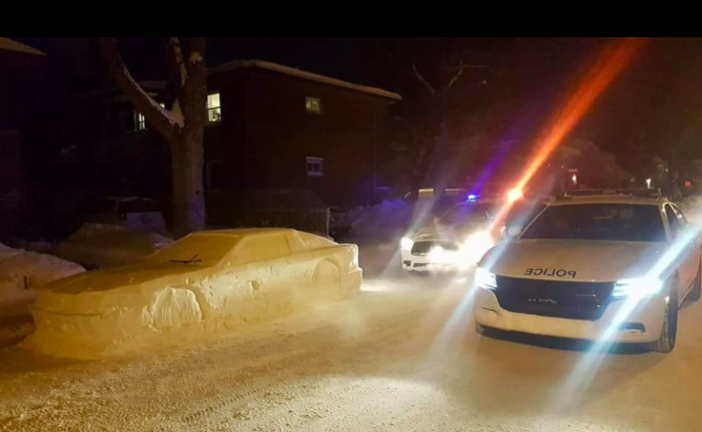 Images of the literal snowmobile went viral, showing Montreal police (SPVM) officers parked up and investigating the offending vehicle. Hilariously, one image showed a deceived officer apparently preparing to slap a fine on what he believed to be a car. But when I saw the cops pictures on internet the next day, it was even better. Great Scott, is that supposed to be a DeLorean? Did the officer write down the license plate ? Sadly, the snow patrol have since demolished the gorgeous work of art in a devastating scene which I imagine was played out to the bittersweet score of The Snowman. However, the memory of the car lives on through social media, with Simon’s fun snow day spreading a warm chuckle to people from all across the world. Some people have dubbed him ‘Mr Freeze’ or ‘Dr Freeze’, with others praising his talent and playful ingenuity. What can we expect next from this accidental, but thoroughly charming, maverick?